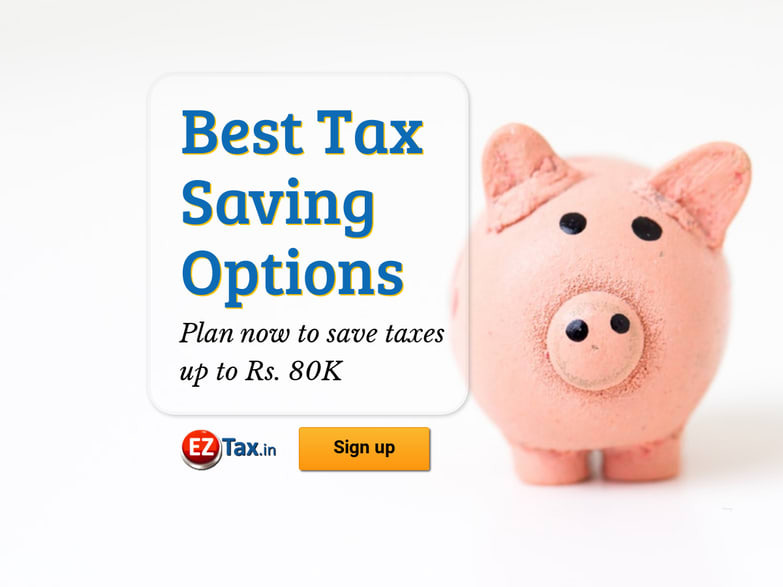 A comprehensive list income tax saving investment options in India for AY 2019-20 that every Tax Payer to follow, and our detailed analysis including rate of return, risks, rewards. Covering under Section 80C, 80CCC, 80CCD(1), 80CCD(1b), 80CCD(2), 80D, 80DD, 80U, 80DDB, 80E, 80G, 80GGA, 80GGB, 80GGC, 80GG. NPS (National Pension Scheme) Get money at the time of retirement, 40% of the return is tax exempted. 12.30% Only 20% exempted when you withdraw before 60 years of age. Health insurance cover for self and family premium paid not only buys the health cover but also help in saving your taxes. From 2018-19 financial year onwards, Savings Account Interest deduction allowed for senior citizens has increased from Rs.10,000 to Rs.50,000/- . No deduction is allowed for the interest earned on fixed deposit (FD). Senior and Super senior citizens can claim a deduction of upto Rs. 50,000/- of interest received from Savings, and Fixed Deposit (FD). This deduction is new and applicable form assessment year 2019-20. There is no limit on the amount of interest on education loan, you can claim as deduction for interest that you pay towards your Education Loan. This loan should have been taken for higher education for you, your spouse or your children or for a student for whom you are a legal guardian. Principal Repayment on educational loan cannot be claimed as tax deduction. The deduction is available for a maximum of 8 years or till the interest is paid, whichever is earlier. Donations made to specified relief funds and charitable institutions as a deduction from gross total income before arriving at taxable income. The amount of donation which can be claimed as a deduction under section 80G is determined as per certain rules. You can claim either 100% or 50% of the amount donated as a deduction subject to 'With' or 'Without' the upper limit. No deduction shall be allowed in respect of any sum exceeding ten thousand rupees unless amount is paid by any mode other than cash. No deduction shall be allowed in case of an assesse whose gross total income includes income which is chargeable under the head 'Profits and gains of business or profession'. Donation to a recognised political party or an electoral trust can claim full tax deduction. Assesse needs to pay donation through cheque, demand draft or internet banking. Cash payments are not eligible for rebate. Out of all the options, investing in Mutual Funds under ELSS (Equity Linked Saving Scheme) is the quick and easiest way to Save on Taxes. EZTax.in helps you save on Taxes. While filing your taxes, you have an opportunity to invest in the ELSS Scheme under 3 minutes.